$700 can buy you a nice camcorder that can take exceptional HD video. 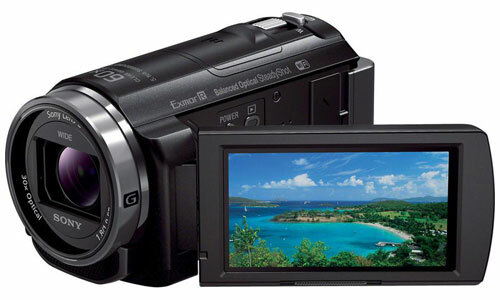 But different camcorder models offer different features in that midrange price. The most dedicated camcorders tend to focus more on lens and image sensor technology so the videos look far better on a TV. But the Sony HDR-PJ540 is rather different as the video quality is a small step below the typical $700 camcorder but the built-in projector stands out as a unique feature and manages to be a bit more advanced than Sony’s more affordable projector camcorders. The Sony HDR-PJ540 is priced like a midrange camcorder and designed like one too. It feels a bit more solid on the hand weighing a few ounces more than its entry-level brethren and comes with a larger display. The bump to a 3-inch display might sound like a minor transition from the 2.7-inch display found on cheaper camcorders but it makes a big difference when previewing HD video thanks to the increased resolution to 460K dots. To preserve the compact size of the Sony HDR-PJ540, Sony made the display a touchscreen so there are no need for neighboring physical controls. The whole touch navigation experience is a bit subpar compared to the Sony camcorders with 3.5-inch displays but you won’t need it very much after making all the necessary configurations. Essential buttons like the power, preview, and projector buttons can be found on the side of the camcorder with the door open along with two micro HDMI ports and a small memory card slot beneath a small flap. The opposite side of the HDR-PJ540 is the usual hand strap which always gave pure camcorders a leg up over smartphones and DSLRs but Sony’s design has an innovative element. This strap is home to a built-in USB cable that works like any charge and sync cable so you don’t have to worry about forgetting a spare cable. With no non-projector counterpart, the Sony HDR-PJ540 is in a pretty unique position but it makes the cheaper projector camcorders look less interesting because of its 25-lumen projector. Last year, you had to spend about $899 for the HDR-PJ650 and you only get a 20-lumen projector so the HDR-PJ540 is a great improvement. It even has both an HDMI out and an HDMI in so other devices can output visuals using the camcorder’s projector as a display. This eliminates the need to buy one of those cheap LED nano projectors and the visuals look really good because of that increased brightness. Another interesting improvement happens to be something that was absent in all of Sony’s projector camcorders released the previous year – built-in wireless LAN and with many competitors offering that functionality out-of-the-box, it is about time Sony is jumping on that train. PCs, laptops and mobile devices can all receive videos and images from the Sony HDR-PJ540 over the air but Android and iOS-powered devices get a more special treatment in the form of the Sony PlayMemories Mobile app. It is the same app that Sony’s Wi-Fi-enabled cameras rely on so you get the same easy interface whether you need to retrieve content from the camcorder or have fun with remote shooting right from the smartphone or tablet. With onboard NFC, NFC-compatible devices can tap on the camcorder and instantly initiate a wireless pairing to make these extra features immediately accessible. As a standard digital camcorder, the hardware is in a pretty good spot with its impressive wide angle Sony G lens which has a 35mm equivalent of 26.8mm making it great for traveling and you can capture those faraway subjects by zooming in to 30x without ruining the detail. Normally, going beyond the optical zoom range compromises on video quality but the new Clear Image zoom technology doesn’t and it doubles the peak maxing out at 60x. These lens specifications are exactly what the Sony HDR-CX330 offers and at a lower price too since it does not have the built-in projector. But the HDR-PJ540 takes it a little bit further by offering an improved variant of Sony’s Optical SteadyShot technology called “Balanced Optical SteadyShot Image Stabilization”. This refined technology provides the same image stabilization benefits to reduce the effects of hand shakes while also lowering distortion and vignetting so even casual users should notice a substantial improvement to ordinary videos. The Intelligent Auto mode continues to be the staple default setting for Sony’s camcorders including the Sony HDR-PJ540 and it works as it should as it analyzes a scene and then takes setting improvements from 10 different scene modes resulting to dozens of possibilities in improving different scenes. You still have the freedom of taking full 1080p video at 24 or 60p and take pretty good 9.2-megapixel photos as well. With the back-illuminated Exmor R CMOS sensor, results under low light conditions look pretty good too. Exclusive to Sony’s 2014 camcorders, you get an additional option that could make good use of the onboard 32 GB storage – dual recording. If you are not sure whether to choose between AVCHD for high-quality recording and MP4 for a smaller file size that is easier to upload to the Web, you can now have the camcorder record it in both formats simultaneously. Adding an extra memory card is, of course, recommended. You won’t exactly get the same app ecosystem as an Android phone or iPhone with a decent video recording capabilities but you can apply one of the new 7 picture effects for videos and images. This means that you can apply popular effects like Pop Color and Toy Camera all without separate software. It is a bit odd for the Sony HDR-PJ540 to not have a direct CX counterpart but this could be Sony’s strategy to make their projector lineup of camcorders stand out a little more. While not everyone may see the need to preview a 1080p video on the wall, that isn’t the only thing you can do with this projector. The HDMI input opens up plenty of possibilities and the rest of the features nicely justify the $700 price tag.